Published August 2, 2011 By Anna T. This post may contain affiliate links. Regardless, I only recommend sites I've researched and/or used and trust. Opinion Outpost is one trusted, legit survey panel company that I feel I can stand behind and recommend to you because I have been able to earn some extra cash with them before. They also are known for paying lightning fast once you have enough money to redeem there. This is easy. Just create an account by filling out some basic info and then click the link in your confirmation email they send you. If you don't see the confirmation email, be sure to check your spam folder. You must be 18 years old and resident of the US or Canada to sign up, and there is only one account per household allowed. After you've done all this and have access to your account, you'll need to go through and answer a few survey questions (fill out user profiles) so they can better match you to different studies. Don't feel any pressure to get these done all at once. You can do them here and there when you have time. You can log in as often as you wish to see if there are any surveys available to take. Opinion Outpost will also email you when you have surveys available. Each survey is worth a certain number of Opinion Points. Every 10 Opinion Points is worth $1. You can attempt all the surveys you have access to, but you won't necessarily qualify for every single one. In most cases, they can determine if you're the type of person they are looking for after you've answered the first few screening questions. You'll be booted out of the survey if you aren't a match. Some survey companies end up making you answer about 10 minutes worth of questions before disqualifying you, but in my experience Opinion Outpost is not that bad for this. They'll let you know in a hurry if you don't qualify for a survey. Once you have accumulated 50 Opinion Points ($5), you can request a check from Opinion Outpost. They have paid me multiple times and it doesn't take forever for them to send the check out after you ask for it. I can't remember exactly how long it took the last time, but I'm thinking not longer than one month or a month and a half. This might seem like a while, but believe me when I say that other survey sites sometimes drag it out longer than that! You can also refer your friends to sign up for Opinion Outpost and earn even more points. Update: There is now a Paypal option for getting paid! People are reporting the money comes almost instantly after you request it to Paypal once you have enough to cash out. If you absolutely hate redeemable points, check out this list of survey panels that don't pay in points. Overall, it's a highly-rated survey panel and people, including myself, get paid. However, I should warn you that there are reports online of account closures with little to no warning. In fact, a reader emailed me the other day to let me know her account was closed for “inappropriate answers and speeding violations” just before she reached the cash out threshold. Just something to keep in mind. Sometimes Opinion Outpost surveys lead to product tests! You won't necessarily know this until you've made your way through a big portion of a survey. I love this! Testing out products before they are released and then giving your feedback is seriously fun. Who doesn't love getting packages in the mail?? Go here to get started! And then comment below to share your own experience with Opinion Outpost. I'll conclude this Opinion Outpost review by sharing with you some info on my eBook. “Your Guide to Taking Paid Surveys For Extra Cash” contains seven years of my paid survey experience showing you why your opinion is needed, a great system to follow for taking surveys efficiently, how you earn money, and of course WHERE to earn money, inside 27 no-fluff pages! Go here to download at Amazon, or you can read it free with a Kindle Unlimited subscription. Also, you do not need a Kindle to read it. You can read Amazon eBooks on any device using Amazon's cloud reader. I HATE opinion outpost. I have an account there, and it seems like for most surveys, I get halfway through with them to find out I don’t qualify. Well how do I NOT qualify when I’ve already done half of the survey? and then they don’t give me any points, so it was all a waste of my time. Hey, thanks for reviewing this site. I signed up with them after reading your review and have made $30 with them in the last week. It’s really been a great deal for me. You’re welcome 🙂 That is a great amount to earn in such a short period. I’ve always liked Opinion Outpost. I’m a member of this one. I never seem to have many surveys available through survey sites though. But, I believe that is because I don’t have kids at home. Demographics are a huge factor when it comes to what is available. This is true. It can be hard to qualify into surveys on occasion, which is why the money is never a guarantee. I remember when I first started taking surveys I signed up with every company I could find to increase my chances of qualifying for several on a daily basis. But needless to say that also led to my inbox getting crammed full of junk. I’ve heard Clixsense mentioned before but don’t know much about it. That’s nice that they give you a few cents even if you don’t qualify. I guess that makes you feel like you didn’t totally waste your time. I was recently able to cash out. I like the site. I felt like it was on purpose when I only had four more points to earn to cash out and it took a month, lol, but I did it! I know on mine, for a $20 check I had to earn 200 points? That’s probably right because 10 points is equal to $1 on Opinion Outpost. I have wondered before too if certain companies were purposely not giving me any surveys to take when I was close to cashing out! It does seem odd that they dry up right when you’re almost there. Nice to narrow down the few survey places that are worth the time! So so so many of them to sift through!! yep, if you’re going to bother with survey sites at all, it’s best to use the ones that don’t waste a lot of your precious time. 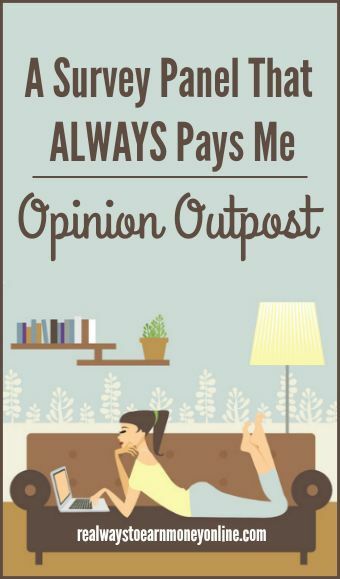 I have been a member of Opinion Outpost for over 6 months, and I have made $20, so not too bad, but not great. I often waste time qualifying, which irks me wasting 10+ minutes, when I could have been earning money elsewhere. The best survey site I have come across is Pinecone Research, which pays you $3 per survey, and the deposit is made by the next day to your Paypal account. I am averaging $24 a month, which does’nt seem like a lot either, but I use it to purchase needed items online. I agree that Opinion Outpost is not as great as Pinecone, but I do think they are a step above most other similar sites. Pinecone is wonderful! You really can’t beat that company. I earned hundreds of dollars through market research studies, in person or by phone, I found on Craigslist, but they like to restrict it to once every 3 to 6 months to qualify. Now I am checking Mindswarmps and True Panel webcam based market research studies, which promise paying 2-3 figure compensation, but didn’t have any luck getting selected. Do you know any other good ones? I think 2020 Research is the only other one I know about that actually pays very well. I think the average for them is $50 to $150 per study if you’re selected to participate.